Upcoming Events with Jean-Paul Jauffret! 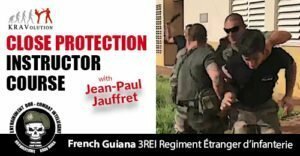 Jean-Paul Jauffret has more than 30 years experience in training and education, including 20 years as an instructor of the 2rd REP paratrooper regiment of the French Foreign Legion on Corsica. He recently leads the S.W.A.T. Instructor Course at the 3rd REI Infantry Regiment of the French Foreign Legion in French Guiana. In addition, Jean-Paul is also family guy and knows what it means to defend himself and his family in a case of emergency. As a former police chief of Corsica Jean Paul also knows what matters in the everyday life of a police officer. Back to the roots – Explore with KRAVolution the land where Krav Maga was born. Discover Israel and train Krav Maga with us at the beach. Join us on the Train and Travel Tour 2018 “TRAVolution”.